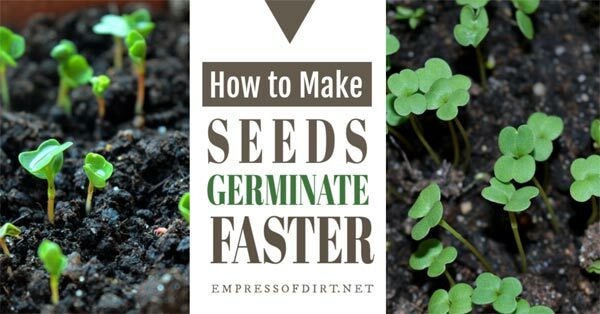 Want your seeds to sprout faster? Have a look at the creative ways home gardeners make use of warmth around the house to help speed up and increase germination rates. Also, see this printable list of the best soil temperatures for seed starting. Each seed type has a range of temperatures from low to high that encourage germination (along with moisture). Within there, there is a minimum temperature, sweet spot, and maximum temperature. Too cold or too hot and the seed either cannot sprout (cold) or may sprout and die (hot). So, for best results, we learn the sweet spot and provide it for best germination rates. In general, our traditional spring and autumn crops including peas, and salad greens (see a longer list here that you can print out), that grow nicely in cold or cool conditions, are the same crops that like moderate soil temperatures for seed sowing. Very generally, this group germinates best with soil in the 50-68F | 10-20C temperature range. The tender, warmth-loving crops like tomatoes, eggplant, and peppers (see a longer list here that you can print out) prefer warmer soil to sprout. Again, very generally, they will do fine if the soil temperature is 68-79F | 20 -26C. Best Soil Temperatures for Sowing Seeds lists more of the vegetables and herbs that fall into to these two groups. You can measure soil temperature with a kitchen meat thermometer. Take a few readings at different times of day, over a few days, to be sure of your results. Seeds need both moisture and warmth to germinate. Warm up the soil before sowing your seeds. And warmth from below the seed tray is best, without allowing the potting mix to dry out. Outdoors, soil temperatures can be warmed by adding a few inches of compost to your garden bed to keep heat in, using natural or plastic mulch to warm the soil for days or weeks prior to sowing, or positioning cold frames in a sunny location. Let the sun work for you. Indoors, gardeners come up with all sorts of tricks for speeding up seed germination. Because most seed types do not require direct light until the seeds have sprouted, you can place the seed tray elsewhere in your house where heat is available to warm the soil from below until the seeds sprout. I’ve listed some ideas below. Keep in mind that high temperatures will kill seeds or dry out seedlings, so stay in the desired temperature range. More is not more. You can measure the temperature of your soil or seed starting medium with a kitchen thermometer to ensure you are keeping it in the desired range. If you want a product made just for this purpose, consider getting a proper seedling heating pad. Check the size of the mat you are buying. You may need a few to accommodate all of your seedling trays. These ideas are hacks, meaning they are unconventional solutions. They are simply ideas, not advice, and anything you try is entirely at your own risk. If something seems unsafe, don’t do it. The idea is to make use of heat produced in your home for other purposes and have the seedling tray nearby. No matter what you choose, the idea is to gently warm the soil from below, not above, and to do it in a safe manner. In many of these examples, you are making use of leftover heat when the appliance is OFF (after use). Some place a baking sheet with a dish towel on top above the warm surface and place the seed starting tray on top. Even with just a couple of hours of slow heat, some seeds respond quickly (within a day or two) to added warmth. A device like a slow cooker partially filled with water can offer continuous heat for several hours. Seeds like peppers germinate much faster with warmth like this. 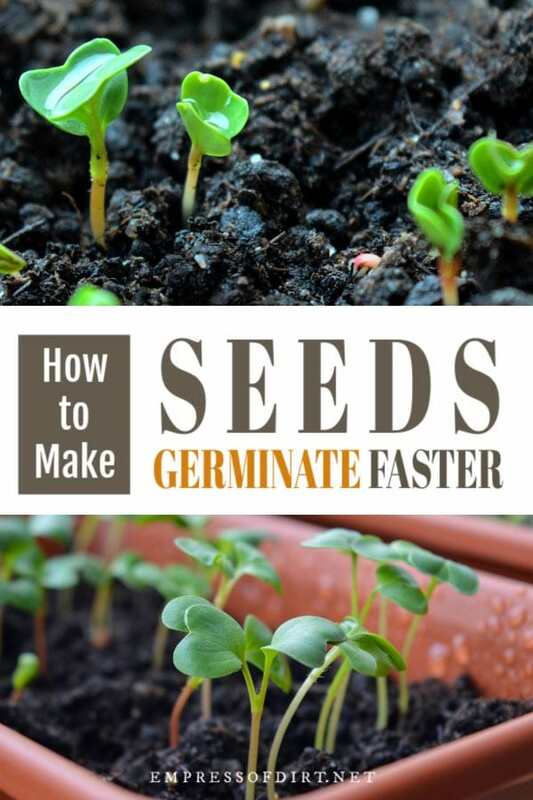 You can see an example of this in in tip #1 here: speeding up seed germination with a slow cooker. Always read your seed packets and follow the specific sowing instructions. If the seed company knows a good trick, it’s usually listed right there. Some seeds with tough coats like delphiniums benefit from pre-soaking in damp paper towels for a few days prior to sowing. Some seeds require scarification (scratching of the seed coat to allow the embryo to emerge) or stratification (varying the temperature), such as pre-chilling seeds in the fridge, or introduction to warmer soil, as we have discussed here. Again, these tips will be listed on your seed packet if applicable. A regular digital kitchen thermometer or meat thermometer works fine for measuring soil temperatures. Check your soil temperature with a thermometer to be sure it’s in the optimum range for your seeds. In general, warmth-loving plants favor warmer soils, and cold-loving plants like it a bit cooler but the key is always to have soil temperature in mid-range for successful seed sowing. If you are sowing seeds indoors and need warmer soil, look around for existing heat sources that you might be able to make use of (safely) for warming seed trays. Happy growing, and be sure to get the list of best soil temperatures for seed sowing here. If you would like help with seed starting, see Seed Starting for Beginners for all my top tips. Dear M sorry to say ordering that soil meter you advertised they refuse to ship it to Latvia? Any place else in this world yes??? Latvia is a republic and an EU nation.Yet never will USA or as it seems now, Canada ship to this part of world called Europe. Apologies but I can only link to one source and, since most readers here are in the US, I link to amazon.com. It would be a full-time job trying to source things in other parts of the world! Great article! I want to get a seedling heating mat, but for now I’m using the household hack of putting my seedlings on top of the fridge. I put them on a tray in an open plastic bag and set them up there. The fridge keeps the seeds warm, the tray helps me not to make a big mess while watering, and the plastic keeps moisture and heat in. I’m hoping to see germination soon!